Puzzle Bloom is the innovative action-puzzle game where you control the tree spirit Canotila in her quest to bring back life to her island. Canotila needs the assistance of the island’s native creatures to get past the rigid machines of the world. She flies from creature to creature and uses her powers to guide them. New life will bloom into the world for each time Canotila breaks a machine, bringing Canotila closer to her ultimate goal of a return to nature. The game was developed using Unity. It is the first time DADIU has decided to use this engine before they used Valve's Source Engine. The game is free to play it only requires that you have the Unity Web Player installed. My contribution as a programmer during this game production mainly consisted of creating path-finding techniques for the NPCs in the game, but I also helped the audio designer and game designer by creating various scripts to allow different requested functionalities. All coding was done in C#. 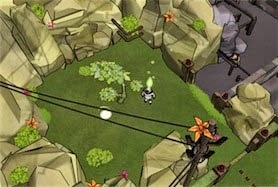 Puzzle Bloom has been accepted at the Penny Arcade Expo 2009 as one of the PAX 10. The game have been chosen out of over 150 submissions. The game has also made it as one of the 10 games for the 2010 IGF student final.